Marx argues that this story is inadequate to account for the origin of capital. It is not enough to simply save money, because the accumulation of money does nothing to produce those with nothing to sell but their labor power. In order to get workers a huge population must be separated from the means of production, cast off the land and out of the commons. The origin of capitalism is not a moral story of thrift, but a bloody story of expropriation; a story which eventually encompasses the whole history of slavery, colonialism, and even the reformation. Marx ended Volume One of Capital with this critique, David Graeber opens his book, Debt: The First 5,000 Years with a critique of another contemporary fable. This fable concerns the origin of money. This story, which can be traced back at least as far as Aristotle, begins with an economy based on barter, but, as anyone who has brought their cow to the market and came back with magic beans can tell you, barter is incredibly inconvenient. Money, the story claims, then comes into existence to solve the shortcomings of barter, the difficulty of bringing objects to the market, and the time spent waiting for someone who had what you wanted and wanted what you had. Most importantly, money is an affair of equals, grounded only on convenience and interest. This is why this story is so popular with Adam Smith and contemporary economic textbooks. Graeber argues that there is one thing wrong with this story: it never happened. He uses a great deal of archeological and anthropological evidence to argue that this smooth transition from barter to money never took place. All of this historical evidence is based on one simple problem: barter presupposes a kind of sociality of people who are entirely disconnected, without bonds, but not engaged in direct conflict. Marx would say that it presuppose bourgeois subjects, subjects connected only by self-interest. What Graeber argues is that history, or rather anthropology, has documented all sorts of ways in which goods circulate, but this circulation is usually one in which bonds of all sorts, friendships and debts, circulate as well. 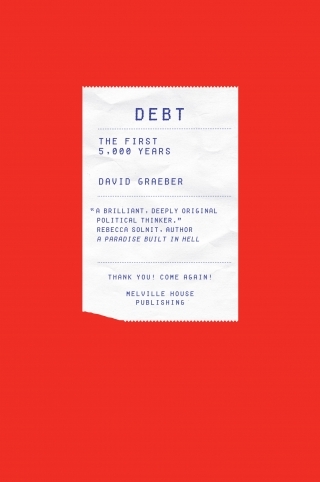 Graeber gives more credit (I actually don’t know if I intended that pun or not) to a different account of money, primordial debt theory, which argues that money emerged from the taxes, from the state’s need to generate money. This theory begins with a fundamental asymmetry, not an equivalence, an asymmetry that is often founded on religion, on the sense of debt owed to the world. (Readers of Deleuze and Guattari will recognize a great deal of this emphasis on the primordial debt running through Anti-Oedipus and A Thousand Plateaus). Graeber spends much of the book analyzing the history of this particular logic of hierarchy and equality, hierarchies that determine who is expected to pay their debts and who can hold onto them. This hierarchy continues to the present, to the current moment of bailouts for some and austerity for others. 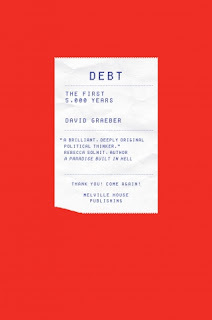 However, Graeber’s book is not a history; yes, it covers the five thousand years of debt, slavery, the gold standard, and the fiat system are all discussed, but primary as different transformations of this logic. Graeber is primarily interested in the way in which monetized debt intersects with, and separates itself from, social bonds and obligations. Graeber’s point is well taken, there is much to be said for this communism of everyday life, the way in which cooperative relations permeate our daily actions. It is important to contest the anthropology of neoliberalism, the claim that we are always and naturally engaged in cutthroat competition, seeking maximum gain for minimum expenditure. Such an anthropology simply does not account for all of our tendencies to offer aid in all sorts of ways. It fails to describe actual daily life, even in capitalism. As a somewhat abrupt conclusion let me say that I paired Graeber with Marx for two reasons, two reasons that have nothing to do reviving some anarchism versus communism debate. First, I think that the fantasy of barter, of money arising from barter, is just as a false and pernicious ideology as the moral story of so-called primitive accumulation. These stories are pernicious not because of what they say about the past, but what they do in the present. The moral idea of the thrifty capitalist and shifty worker continues into our contemporary discussions of “job creators” and lazy unemployment recipients, just as the idea of money as egalitarian underwrites the ideal of the free market as a social relation without subordination. Graeber’s critique of barter needs to be placed alongside Marx’s account primitive accumulation. However, and this is the second reason, I read Marx’s critique of so-called primitive accumulation to also be a critique of an explanation of history based entirely on human motives and intentions. Capitalism is not a matter of thrift, waste, or greed, it is a matter of surplus value, labor power, and other real abstractions. Thus, communism may be the foundation of all sociability, but capitalism is often indifferent to the sociability, or, worse still, exploits it. As a topic of inquiry debt crosses back and forth from the economic to the moral, and thus it is tempting to locate its history in attitudes and ideas, but a true history of debt needs to also examine the structure that are indifferent to those ideas. Yes, Graeber discusses the guilt debt connection from the Genealogy. He has a odd reading of it, however, seeing it as a kind of reductio ad absurdum of the basic bourgeois ideal that all debts have a price. It is amusing to read the following sentence in the NYtimes: ""Mr. Graeber, whose most recent book is “Debt: The First 5,000 Years,” an examination of barter systems, is credited with suggesting that “we are the 99 percent” become the rallying cry for the movement."" [Occupy Wall Street Protest Reaches a Crossroads by By CARA BUCKLEY and COLIN MOYNIHAN 11/4/11]. Yes, it could be called an examination, if by examination you mean a critique of the very idea of barter systems, and that money arose out of barter. However, I think that this is at best a willful misreading that presents Graeber as an advocate of barter society, after all, he is an anthropologist.